Our visitors appreciate our warm and personal approach, as well as the rustic setting we have maintained in our beautiful sugarbush over the years. 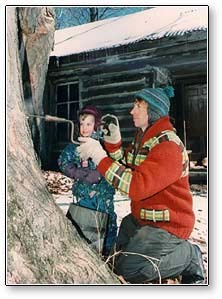 Our Maple Sugar Bush is located at the home farm. CLICK HERE for maps and directions. Class demonstration. The maple cabin. Boiling down the sap. The Monkey tree. Fresh hot pancakes. The festival is open to families on weekends - No reservation required. Formal group tours (20 plus) are available on weekends and weekdays. Please call 905-888-1738 for information and reservations. Maple syrup tours only occur at the Horton's Home Farm at Vandorf.